Global Fish Survey Trained SCUBA divers with the Reef-Life Survey (RLS) project recorded the fish fauna at 1,844 rocky and coral reef sites in 11 Marine Ecoregions of the World (MEOW) realms by visual census. Many sites are overlapping or hidden behind symbols for other sites. Map courtesy of Jon Lefcheck. Research Team The functional-diversity study was initiated during a November 2012 workshop in Tasmania. Photo courtesy of Jon Lefcheck. Teeming with species, tropical coral reefs have been long thought to be the areas of greatest biodiversity for fishes and other marine life—and thus most deserving of resources for conservation. 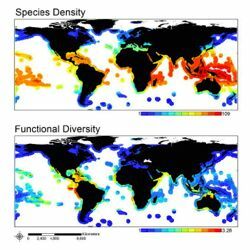 But a new global study of reef fishes reveals a surprise: when measured by factors other than the traditional species count—instead using features such as a species’ role in an ecosystem or the number of individuals within a species—new hotspots of biodiversity emerge, including some nutrient-rich, temperate waters. 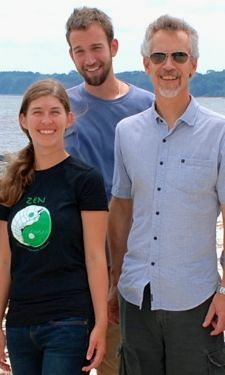 The study, by an international team of researchers including graduate student Jon Lefcheck and Professor Emmett Duffy of the Virginia Institute of Marine Science, appears in this week’s issue of the journal Nature. Led by Dr. Rick Stuart-Smith of the University of Tasmania’s Institute for Marine and Antarctic Studies, the study team also includes researchers from Stockholm University, the University of Bologna, Stanford University, the Natural Products and Agrobiology Institute in Tenerife, Spain, the Wildlife Conservation Society’s Indonesia Marine Program, the University of Dundee, the Pontifical Catholic University of Chile, and the University of Portsmouth. The study is based on information collected through the Reef Life Survey program, a "citizen science" initiative developed in Tasmania. The RLS program now operates worldwide, training recreational SCUBA divers to survey numbers of reef animals and supporting their research endeavors. Stuart-Smith and fellow RLS founder Graham Edgar, also a University of Tasmania professor, highlight the central role the volunteer divers played in contributing to the new study. “The assistance of over 100 dedicated divers has allowed us to look at ecological patterns and processes impossible for scientific dive teams to cover,” says Edgar. The number of different species in an ecosystem—what researchers call “species richness”—has dominated the scientific view of global biodiversity patterns since the days of Darwin and Linnaeus. It has also long been used as a biological basis for management of imperiled ecosystems. The team conducted their study by analyzing data from 4,357 standardized surveys conducted by RLS divers at 1,844 coral and rocky reef sites worldwide. The surveys spanned 133 degrees of latitude and found 2,473 different species of fish. Moving beyond traditional species counts, the research team noted how the members of each of these species make a living, using a detailed matrix of “functional traits.” These include what the fishes eat (plankton, invertebrates, algae, other fish, or a combination), how they eat it (browsing, scraping, or predation), where they live (in, on, or near the bottom or free-swimming), whether they are active at night or during the day, and how gregarious they are (solitary, paired, or schooling). Lefcheck notes that the team’s study also looked at how individuals are distributed among species—what scientists call “evenness,” and that doing so further alters global diversity patterns. “Coral reefs have lots of species but many are doing largely the same thing, whereas temperate reefs with many fewer species tend to spread individuals out among species that are doing different things,” he explains. The team’s findings have important implications for planning and management. Lead author Stuart-Smith notes, “Incorporating information on functional traits into monitoring programs will add an extra dimension and greater ecological relevance to global efforts to manage and conserve marine biodiversity”.